In 2017, approximately 180 homeless cats, kittens and dogs rescued and placed in adoptive homes by FOCAS!! All home-nurtured in foster care!!!!! Meet FOCAS Angels "Joey" and "Trooper," abused puppies rescued by FOCAS. Scroll down to see how you can help other Angels or click here. See our Thank You keepsake! 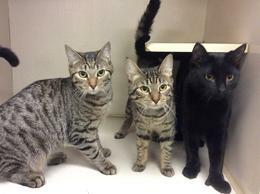 Eddie (L) Debbie (C) Charlie (R) See them on Petfinder. Preview FOCAS pets for adoption. Check it out! See Events for details on the FOCAS 2016 Calendar. Be A FOCAS Volunteer. Join our volunteer family to expereience the gratification of serving your community and saving lives first-hand. Save a life. Make a PayPal donation below. Your support is priceless!! FOCAS homless animals benefit from purchases made for your pet. Visit www.petrescuerx.com to learn more. Help FOCAS befriend an animal in need. Join iGive, an internet shopping mall with over 80 merchants. All will donate a percentage of your purchase to FOCAS. It doesn't cost you anything, and the total amount donated is tax deductible. Just for registering, FOCAS receives a $5.00 donation. An additional $5.00 goes to FOCAS if you actually shop. Your information is kept private - members' names are not sold to anyone. Please consider registering with iGive. injured animals throughout the County. Your support is priceless! 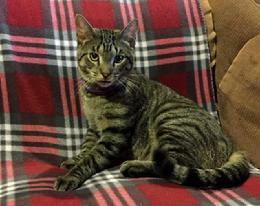 Click here to see pets for adoption at the Bergen County Animal Shelter.